TV with Thinus: 'Netflix threat' remains overblown as MultiChoice adds another 400 000 pay-TV subscribers - although DStv Premium subs continue to shrink. 'Netflix threat' remains overblown as MultiChoice adds another 400 000 pay-TV subscribers - although DStv Premium subs continue to shrink. The much-hyped "Netflix threat" remains overblown with MultiChoice that added 400 000 further DStv and GOtv subscribers as well as Showmax users to its pay-TV business in South Africa and Africa compared to a year before, although the share of DStv Premium subscribers continue to shrink as consumers don't see MultiChoice's top tier as offering enough value for money anymore. Naspers released its interim results for the 6 months to 30 September 2018 on Friday afternoon and added another impressive 400 000 pay-TV households across Africa. That brings the total to 13.9 million pay-TV subscribers, of which 7.2 million are in South Africa that remains MultiChoice's biggest market, and a combined 6.69 million in the rest of Africa. Naspers said that its "value strategy", one aimed at "growing the subscriber base and reducing costs" lead to $15 million in cost savings. MultiChoice's pay-TV growth was strong in the middle-income and mass-market segments where it added 285 000 pay-TV subscribers in South Africa during the first half of the 2019 financial year. While the DStv Premium base continues to grow, it's not growing as fast as the mid-market tiers, and as a result continues to represent a smaller and smaller portion of overall subscribers. While MultiChoice Group CEO Calvo Mawela earlier this year blamed DStv Premium drop-off on Netflix South Africa's aggressive expansion, Naspers on Friday said that the pressure leading to DStv Premium subscriber churn is due to consumers coming "under some disposable income pressure" and not because of competition from video streaming competitors like Netflix. What the drop in the overall percentage of DStv Premium subscriber numbers means is that MultiChoice is making less average revenue per subscriber - or a decrease in the ARPU (average revenue per user) - from $27 (R347) a year ago to $25 (R335) currently) as consumers opt for DStv Compact Plus and DStv Compact instead of DStv Premium. That is a drop of 3%. At MultiChoice South Africa "the focus of the South African business remains retaining premium subscribers while driving subscriber growth in the mid- and mass-market tiers" Naspers said. 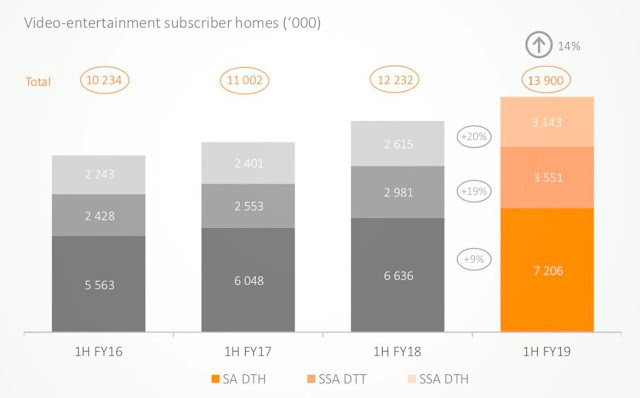 "Subscriber retention is underpinned by rising PVR penetration uptake of connected video services, and roll-out of additional services, for instance Joox Music launched in October 2018)." PVR use by DStv subscribers ticked up slightly, from 20.1% during the same period a year ago, to 20.3%. of significant investment in content and subscriber acquisition, mainly through set-top box subsidies". "Customers added by this promotion will contribute to second-half revenues and profitability, driving year-on-year improvements." 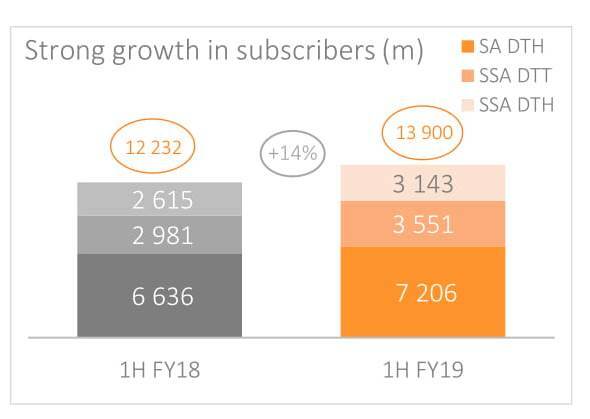 Naspers says that in sub-Saharan Africa, outside South Africa, subscriber growth accelerated and the business generated 9% (16%) growth in revenues to $524 million. Naspers says "this improvement would have been stronger but for the Fifa World Cup promotional drive" and that results were also affected by "the 42% devaluation of the Angolan kwanza since January 2018". "The limited availability of foreign currency in the Angolan and Zimbabwean economies continues to affect liquidity."